Michael Boso owes a lot to Marist. 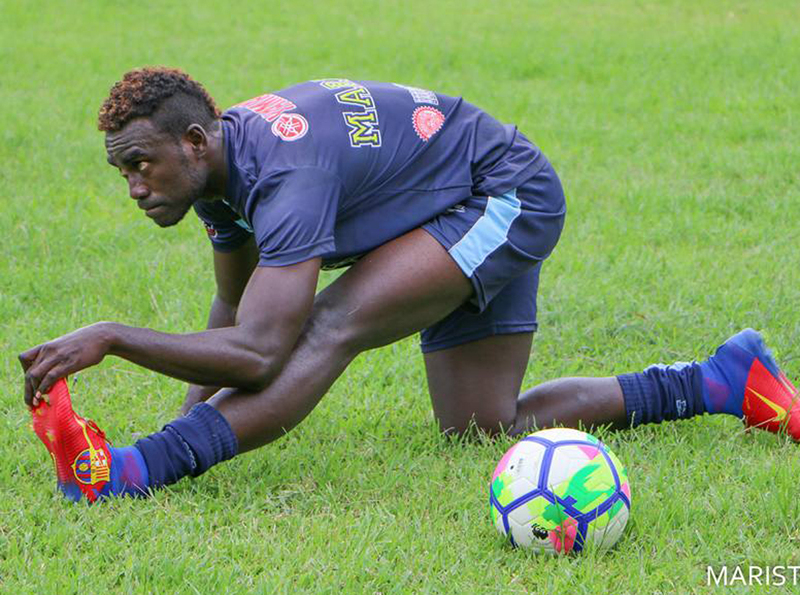 The lofty defender had always dreamed of earning a coveted spot in the Solomon Islands national team but was faced with a string of rejections as he sought to find his place in the club landscape. Enter Marist FC and former coach, Brazil-native Juliano Schmeling. “It was a privilege for me to have Juliano come to Solomon Islands because I had a goal of playing for the national team and I tried with a lot of clubs but they didn’t want me,” Boso said during the 2017 edition of the OFC Champions League. Giving a young player a chance may seem like a small gesture but for Boso it was a turning point in his football career. “Marist FC is one of the great teams in Solomon Islands,” he stated. Growing into his style alongside the experience of dual, and even triple internationals like Jeffery Bule, Robert Laua and Anthony Talo, Boso also has Solomon Islands legend Henry Fa’arodo and Papua New Guinea international Koriak Upaiga, to pick the brains of. Although he has previously played up front, Boso has very much played the role of a traditional defender with Marist. However of late he’s started to evolve, developing a greed for goals and the desire to make an even greater contribution to the squad. “I understand very well how to play forward and I have the ability and the skill to score goals,” he said. “I believe that I can do even more, even though I am a centre back. I have two key things that make me want to drive further forward. Being able to play a contributing role in his side’s OFC Champions League campaign has been one way Boso feels he’s been able to return the favour to a team and club which has given him so much. “I’m proud of this club for reaching his far,” he said. A week before landing in Vanuatu for the match against Nalkutan, Marist faced one last test on home soil. The final of the TSL Championship was played against fellow OFC Champions League quarter finalists Solomon Warriors and was a tight contest. Boso played a role in scoring his side’s lone goal as they went down 3-1 to the Warriors and while that may have been a tough blow so close to the quarter final, the 26-year-old believes it’s something that has only made Marist stronger. “For me, my view is it is almost good we lost that game so we can look at our mistakes and work on improving in the areas we’ve not identified as weaknesses for us. “Team morale is high at the moment. We feel the same spirit as when we drew against Team Wellington in our opening group match. Marist FC will play Nalkutan in the quarter final of the OFC Champions League at Korman Stadium in Port Vila on Saturday 7 April, kick off at 4pm local.